Our accommodation is all on the ground floor, all with access to free Wifi. Our living area is open plan with a fitted kitchen, dining area and sitting area with woodburner. We have oil central heating throughout, with additional heating from a woodburner in the sitting room. The kitchen has an electric oven, microwave, fridge, washing machine and dishwasher. The living area has colour TV with Freeview, DVD player, CD player, books, games and DVDs. All fuel and power is included in the rent, and wood for the woodburner available (honesty box). 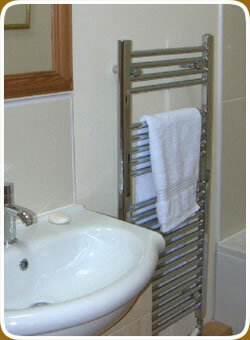 Bed linen and towels are also included in the rent, and a cot and highchair are available. The enclosed courtyard garden has furniture and a BBQ. There is a shop and pub 1 mile away. Note: A supermarket is nearby and they are able to deliver on the day of arrival by arrangement.